Sportsbetting Sportsbook has been on the US market for more than five years. They are a part of Bet Online group and they have a solid rating among US bettors. In this guide, we will cover the main aspects of the sportsbook. In the end, you will be able to decide if it is worth opening an account at Sportsbetting sportsbook. Sportsbetting sportsbook have more deposit methods available than the average US-based sportsbook. Crypto-currencies are becoming more and more popular nowadays and Sportsbetting recognized that. They are offering not one, but two crypto-currencies as their deposit method! Bitcoin and Litecoin are offered and you can deposit a minimum of $20, up to whopping $25000 by using one of these methods. Visa and Master Card are also available, with a minimum of $50 and a maximum of $1000. Bank wire transfer and checks are also available, but they require a minimum of $1000 and $1500, so they are not suitable for casual bettors. When it comes to withdrawals, they offer bank wire transfer, checks and Bitcoin as withdrawal methods. Bank wire transfer and checks have a minimum withdrawal of $500, while the fees vary from $25 for checks to $75 for a large bank wire transfer. Bitcoin is free of charge, so it is our recommended method of withdrawal. 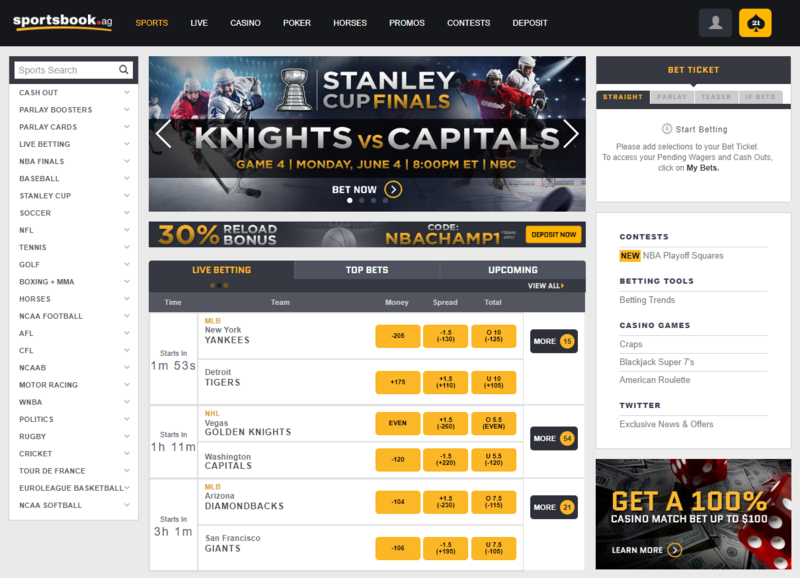 Sportsbetting sportsbook interface is nicely organized and pretty simple. However, it might look a bit outdated and ugly to younger audiences, sowe believe they should think about updating it in the future. Also, when you select a bet, you have to go to the bet slip on the other side of your screen to select the type of bet as well. However, when you get use to their interface this is not a big issue. Mobile website is not the best looking either, but it is functional, and that’s all that matters. Sportsbetting sportsbook odds are one of the best in the business. They are offering a wide range of sports markets as well, especially the ones that are not covered by the biggest names in the industry, such as politics, entertainment, while MLB is their biggest strength. Minimum bet is only $1, so Sportsbetting sportsbook is really friendly to casual bettors. Sportsbetting sportsbook doesn’t offer a classic welcome bonus and rewards system to their members. Because of that, there is a whole bunch of people who are not interested to register an account at Sportsbetting, but we think that is not as disastrous as one would think. They offer a 25% bonus on every qualified deposit with a promo code, and you will get some free bet promotions for using their mobile and live betting platforms. However, it is sometimes better to get better odds than some promotions with incredibly tough rollover conditions. Sportsbetting sportsbook is not the place for matched bettors or the casual bettors who chase welcome bonuses and promotions. However, professional bettors will love their great odds and this is a great partner for squeezing more juice out of your bets for sure!